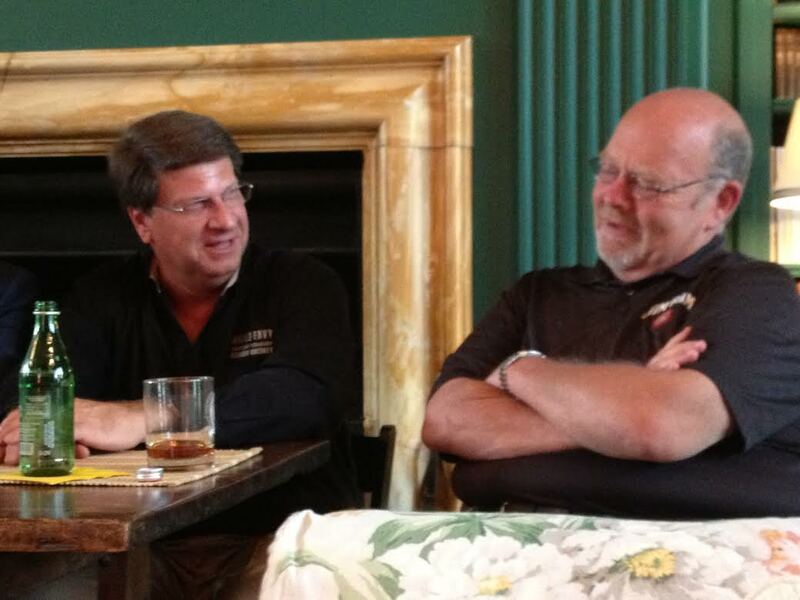 Many amusing stories were shared at the Filson’s Historical Society’s recent Bourbon Salon at Oxmoor Farm, “Bourbon Families,” but one of the most amusing involved the grooming habits of Lincoln Henderson, the longtime master distiller of Brown-Forman who came out of retirement to help his son, Wes Henderson (above left with Jim Beam master distiller Fred Noe), launch Angel’s Envy before passing away last September. While many of us recall our dads splashing on Old Spice, English Leather or Aqua Velva, Wes said his dad favored a unique aftershave: new-make whiskey, specifically unaged Early Times. With an example like that, no wonder Wes followed his father into the whiskey business. 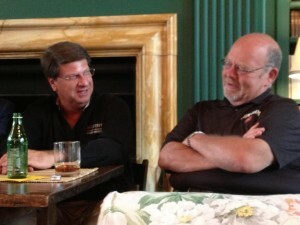 The Salon, third in a series and moderated by bourbon historian Mike Veach, also featured Brown-Forman executive Mac Brown and Maker’s Mark ambassador and retired CEO Bill Samuels Jr. and tastings of Old Grand-Dad Bonded, Knob Creek Single Barrel, Angel’s Envy Rye finished in rum casks and Maker’s Mark cask strength. I’ll share more from them in an upcoming post.